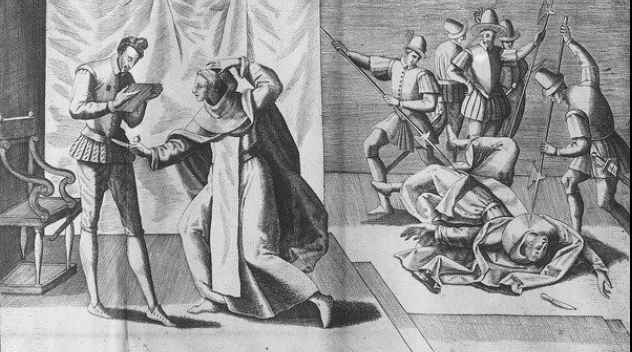 There was no word for terrorism in the sixteenth and seventeenth centuries, but outbreaks of terrorist violence were frequent. In his new book on terrorism in history and literature, Uppsala University Professor of English Literature, Robert Appelbaum, documents the many ways terrorist violence was used, responded to, and written about in early modern Britain and France. In the sixteenth and seventeenth centuries there was no word for terrorism, and this has misled many students of the subject to think that terrorism did not exist. But there were many sensational cases of terrorist violence in the early modern period: to name just a few, the assassination of court official David Riccio in Hollyrood Castle, in Edinburgh, in 1566; the outbreak of the Saint Bartholomew Day Massacre in Paris, 1572; the Gunpowder Plot in London, 1605; the assassination of Henri IV, King of France, 1610. These and many more incidents involved criminal resort to violence in order to communicate to a broad public and achieve political gains. They were unmistakably expressions of terrorism, Professor Appelbaum has found; and even if a word for them did not exist, they played a major role in the political and religious life of Western Europe. Among the major authors who were attracted to terrorism as a subject were Christopher Marlowe and William Shakespeare in England, George Buchanan in Scotland, and Pierre de Ronsard and Pierre Corneille in France. Shakespeare may have known several Gunpowder terrorists personally; certainly his colleague, playwright Ben Jonson did. For all these writers terrorism, by whatever name, provided a creative and moral challenge. How can we be safe in a society where, at any time, an especially shocking and disruptive form of violence may break out? How can we hold onto political ideals, whatever they are, when violence is so often a means for expressing and defending them? How can we speak of violence, when violent people try to do the speaking for us? Professor Appelbaum has uncovered a number of circumstances that made terrorism a threat to civil society in the sixteenth and seventeenth centuries, circumstances not entirely dissimilar to those of today. This groundbreaking study shows how terrorism is embedded in the symbolic life of European culture – as is resistance to it. Robert Appelbaum received his PhD from the University of California, Berkeley, and has been Professor of English Literature at Uppsala since 2011. He is the author of over thirty articles on literature and culture, with emphases on the early modern period, representations of violence, and consumption, including food. He is also the author or editor of five previous books: Literature and Utopian Politics in Seventeenth-Century England (Cambridge UP 2002); Envisioning an English Empire: Jamestown and the Making of the Atlantic World (U of Pennsylvania Press 2005); Aguecheek’s Beef, Belch’s Hiccup, and Other Gastronomic Interjections: Literature, Culture and Food Among the Early Moderns (U of Chicago P 2006, winner of the 2007 Roland H. Bainton Prize); Dishing It Out: In Search of the Restaurant Experience (Reaktion, 2011); Working the Aisles: A Life in Consumption (Zero 2014). Appelbaum has also been a frequent contributor to Times Higher Education and The Baffler. Prior to his appointment at Uppsala, Professor Appelbaum taught at the University of Cincinnati, the University of San Diego, and Lancaster University, England.